Great Barrington — A fundraising meeting Saturday (November 19) convened at the Mason Library for the purchase and restoration of the first African-American church in Berkshire County unexpectedly exposed the charged issue of how to sensitively preserve elements of African-American history in a predominately white rural area. The historic African-American Methodist Episcopal Zion Church is the sanctuary where W.E.B. Du Bois worshipped as a boy. At one point during the meeting a fundraiser’s strategy to encourage donations was likened to slavery auction blocks; at another, the racial makeup of the church’s preservation leadership was questioned. The mid-1800s-built Clinton A.M.E. Zion Church is about to fall apart if it isn’t quickly secured for the winter – mold has ravaged it and the roof needs total replacement. A small volunteer group of citizens stepped forward last month to save the building, which has been on the market for several years after closing its doors. A recent deal with another party to buy the property for $119,000 fell through, but now the volunteer group has the place under contract through the Community Development Corporation of South Berkshire (CDC) along with donations of money, time, materials and office space. In just two and a half weeks since the call went out for help, the group’s coordinator, Ed Abrahams, said the sellers, Eastern Conference A.M.E. Zion Church, gave permission to fix the roof, and four contractors said they would do it for free after being asked by Maia Conty, Generosity Economy Community Organizer. Herrington’s donated the materials, Taylor Rental is donating a lift, and the lead contractor – Steven MacLeay of Sacred Oak Homes – is donating his services. Local property owner, developer and CDC board member Richard Stanley put up the deposit to purchase the building and donated some money and office space. Abrahams said $27,000 is either pledged or in hand, and about $100,000 needs to be raised quickly in order to buy it and shore it up for winter. To make the place useable, Abrahams added, will cost around $200,000. But to bring it to Secretary-of-the-Interior standards will run from around $600,000 to $800,000. The church is on the National Register of Historic Places and is an important site on the Upper Housatonic Valley African American Heritage Trail. “The next step is to create committees to flesh out the mission and develop what’s going to happen in the building, and what level of renovation,” Abrahams added. Many say they want to see it made into a museum to honor native African-American scholar, writer and civil rights leader, W.E.B. Du Bois. VanSant said South County has “denied Du Bois his due respect over the years in ways that this could repair,” noting that an attempt to name Muddy Brook Regional Elementary School, built in 2005, after Du Bois had met with controversy and failed. She also said it was important to unite the mission and vision of the church restoration to the spirit and wishes of former congregants like Fran O’Neill, pictured above. Gwendolyn VanSant in her Muddy Brook Elementary School Multicultural BRIDGE office. “We are losing Black churches in South County,” she added. Philip Deely, a Stockbridge native and former history teacher at Bard College at Simon’s Rock, had read about the plight of the church and said he would donate his fundraising skills to the effort. Deely told The Edge that, over the years, he has raised around $70 million, including money to build the Normal Rockwell Museum. He was asked by Abrahams to sit on the board of trustees. He said he did what he often does to loosen up the tension and get the funds rolling: a Dutch auction. He started by asking if any of the 30 to 40 attendees had $100,000 to give, then worked his way down until someone raised their hand. But the concept of an “auction” salted some deep, historical wounds, and things took an angry turn, said an attendee who declined to be identified. Deely said one African-American attendee felt that the process harkened back to the auction blocks of slavery. Abrahams said the process came to a screeching halt. And Deely said he spoke to the woman after the meeting. Abrahams said he and organizer Beth Carlson have made it clear from the beginning that they are simply trying to start the process and are ready to hand the project and its mission development over to groups and people, particularly African-Americans. Already, he said, Wray Gunn is president of the board. And Abrahams had asked VanSant to be on the board or even to have her or someone from the African American community take on the project. Neither Wray nor Cora Gunn could be reached for comment. “Anyone who wants to be involved, raise money and have a say is more than welcome,” Abrahams added, noting that he has tried to expand the email list. “I’m excited that there is this kind of passion and I hope everyone who came to the meeting continues to participate,” he added. 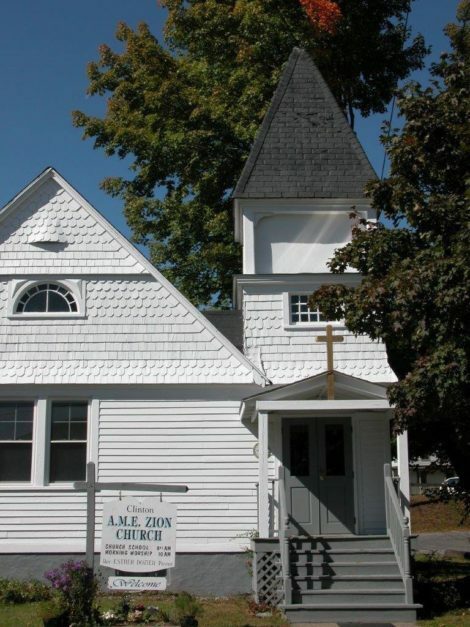 For more information and to contribute to the preservation and restoration of the Clinton A.M.E Church in Great Barrington, click here. I hope it’s doesn’t violate editorial policy to let readers know how to make a tax-deductible donation. Until we get our website up and running we are collecting donations the old fashioned way. Make checks out to HOUSATONIC HERITAGE. In the memo section write CLINTON CHURCH RESTORATION. Mail checks to Housatonic Heratige, PO Box 611, Great Barrington, MA. 01230. Ed — it doesn’t violate editorial policy… when you have your web site up and running, let us know: we’ll provide the link in the story. For now money to Save the Church. Clinton Zion AME Church can be given on line through Housatonicheritage.org . Its convenient but PayPal charges a fee of +/-3%. Checks are best but as one kid donor said , ‘Hey man, I don’t have a check or a stamp!’ Put CCR when PayPal asks for a message. I started out my self intoduction by saying I decided to give my all to this project the day after the election, when I spotted the first story on the church and wanted to do something. Ed Abrahams was the first I spoke to and, then, I called a friend, Skip Meade. Finally I met Beth Carlson and reconnected with Wray Gunn. There are lots of worthy projects what counts is initial leadership. Maia Conty, Generosity Economy community leader coordinated the donation of the contractors time, the materials, the insurance, and the lift, as well as secured one of the largest pledges so far, a detail not included in the article above. Way to be in community Maia, making positive things happen in a time of fear and doubt. I also heard that this church is where the NAACP got started. Sage – W.E.B. Du Bois was the founder of the NAACP. I wonder if perhaps NAACP would donate money to this crucial project. I wanted to thank everyone involved in this crucial project. There is such rich history in and around this church to learn from, and to build upon in the future. I foresee this to be a crucial learning center for all races to learn from, and hope that this restoration and development project continues on to be a fruitful one. This is part of our American heritage, and needs to be given it’s due.